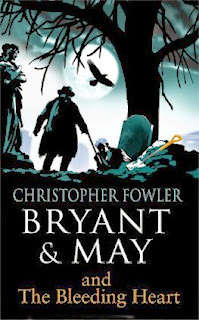 BRYANT & MAY AND THE BLEEDING HEART is the eleventh book about Arthur Bryant, John May and their Peculiar Crimes Unit. BRYANT & MAY AND THE BLEEDING HEART begins with the Peculiar Crimes Unit having moved from being part of the Metropolitan Police to being part of the City of London Police which brings a new issue for them with a new very sharp and business oriented manager overseeing them. Their first case in their new jurisdiction involves two teenagers who witness a dead man rising from his grave at night in a London park. While the others investigate this, Arthur Bryant is seeking to find out how someone could have stolen all seven ravens from the Tower of London - as legend has it, when the ravens leave, the nation falls. I think that this is a good place for a new reader to start engaging in the weird and wonderful world of the Peculiar Crimes Unit as there is a good amount of background information, much of it in the first few pages in the form of a memo from the Peculiar Crimes Unit chief, so that you can see what has gone before. The dark humour that one expects of a Bryant & May novel is there with perhaps more of a tinge of reality than usual and overall this is yet another strong Bryant & May novel with the expected, very intricate plot with lots of twists, turns and misdirections – remember everything is magic. Personally I thought this was the best one yet and am waiting for the next one - THE BURNING MAN.